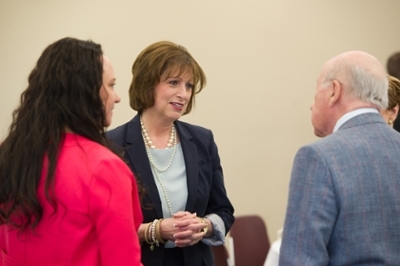 The Southern Illinois University Edwardsville School of Nursing (SON) hosted its 9th Annual Scholarship and Awards Luncheon on Thursday, April 21 in SIUE’s Morris University Center. The event celebrated exceptional student achievement and recognized the impactful support of the School’s sponsors. Scholarships and awards totaling more than $35,000 were presented to 37 deserving students. “We want to express our profound gratitude and appreciation to our donors who make this such a meaningful experience for our students, and for the future of the SIUE School of Nursing,” said Roberta Harrison, assistant dean in the SON. Laura Bernaix, interim dean of the SON, emphasized the significant impact donors make on the continuation of the School’s legacy. She highlighted the remarkable success of the School and its alumni. 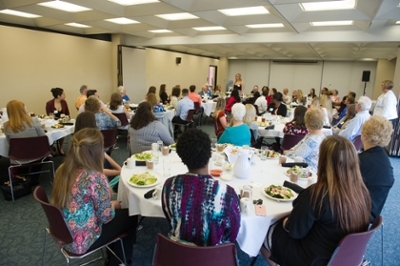 Photos: The SIUE School of Nursing hosts its 9th Annual Scholarship and Awards Luncheon. Dr. Laura Bernaix, interim dean of the SIUE School of Nursing, speaks with guests at the School's Scholarship and Awards Luncheon.